The oven is the place in your kitchen that gets the most stubborn dirt and its cleaning is very difficult and time consuming, not to mention the strong, dangerous cleaning products you will need. Your oven does need special care, but why spend energy on this, when you can use this time to spend with your family? Just let our professional oven cleaners do this task. Our oven care London services will leave your kitchen spotless and ready for your next cooking masterpiece. Why Choose Professional Oven Care? It does seem like a rhetorical question, doesn’t it? Yet here go some of the unique oven cleaning benefits you get only by choosing Professional Oven Care in London. We cover all of London including the biggest areas, which you can see on the right. Easy to find from mobile devices. Just say – oven cleaners near me and you’ll find us. Professional Oven Care covers all areas in London. Kitchen cleaning services in London – stands to reason that if you are in need of professional oven cleaning you may also need other professional kitchen cleaning services – check them out! London BBQ Cleaning – we clean all sizes of barbecues and all types of grill. London’s best Fridge cleaning – no matter the brand, the size or the condition of the refrigerator, we can clean it and make it work and look better. Extractor cleaning – we can clean your dirty extractor and replace the filter upon request. You will be amazed by the extraordinarily effect cleaning your extractor will have on the energy consumption and its effectiveness. Tile and Grout cleaning – the oven care professionals can deliver great quality service and clean your tiles perfectly. For more detailed and exact information you can check our special oven care and our Services page. In the flood of stove cleaning companies in London these days we try to offer to our clients the best of what they really need. All additional costs and spendings in our company are cut. In professionalovencare.co.uk we try to combine the best practices and offer them as a unique and valuable service. Our oven cleaning service sums up our years of experience, new technologies, motivation and research about clients’ satisfaction and quality. Our procedures may include besides oven care cleaning of commercial kitchens, fridges and BBQs. 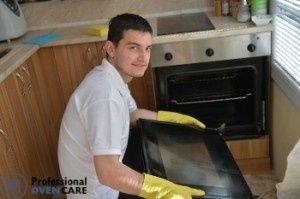 Thanks to our certificates and courses on which we attend our specialists are greatly educated about the proper methods and techniques for one expert kitchen stove cleaning to be persecuted. We offer expert oven care in London every day of the week. Each particular service is separately booked and each client’s individual preferences are taken under consideration. Our mobile cleaning program covers all of London’s areas. The most significant and commonly mentioned ones can be seen listed in our website’s footer. In order to receive the best oven cleaning service for your money as soon as possible, ask our call operators about the schedule of the cleaning team in your area. Call for a free quote and get all your questions regarding oven cleaning answered by our friendly call-center agents. Then just sit back, relax and let our expert oven cleaners in London amaze you. Call now 020 3746 3123, or book online! My kids tried to surprise me and my husband with a dinner but the whole kitchen looked terrible after their efforts. Thank you for helping me cleaning the cooker, the fridge and the whole kitchen. Wonderful tips on the blog and equally good services. My kitchen looks better now. My husband thinks to hire you for the bbq too. Great job. Great work! The Cleaners were also kind and friendly. The oven and the whole kitchen look like new now. The cleaners did a great job. They were on time, cleaned the kitchen fast, were polite and kind. Their English was not so good but the job they did was really worth it. I'm glad i hired you. Thank you and have a nice day. Thanks to your great work, the whole kitchen looks great now. Thank you.